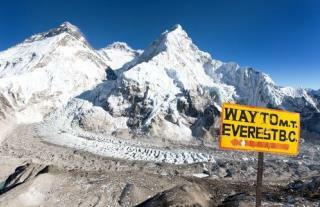 (Newser) – Rest easy, geological watchdogs: Reports that Mount Everest may have shrunk almost a whole inch after April's devastating earthquake in Nepal are unfounded, Chinese officials say. But those same officials note that data culled from a satellite monitoring system shows the deadly quake that killed more than 8,000 people did manage to move the world's highest peak, pushing it about 1.2 inches southwest, CNN reports. Per the Chinese National Administration of Surveying, Mapping, and Geoinformation, which set up the monitoring system 10 years ago to keep track of where and how the mountain moves, Everest (or Qomolangma, as the Tibetans call it) has been creeping northeast at about 1.5 inches annually—a total of almost 16 inches so far—and growing upward at a barely detectable 0.1 inches annually, which means it's gained an inch or so of height over the past 10 years, CNN notes. Could Muslims be right with their long used idiom? Well forget about my climbing it then, it's too far now.